I'll be honest with you. This is the third time I've worn this floral cardigan and taken fashion pictures, but this is the first time I thought the outfit looked good enough to post. I saw these floral cardigans at Charlotte Russe...a younger, hipper store than where I normally shop. I was really drawn to the burgundy one because it had a much smaller floral print, but they didn't have my size in store or on line, so I settled on this black one. And since I brought it home, I had a hard time styling it where it didn't look "old". 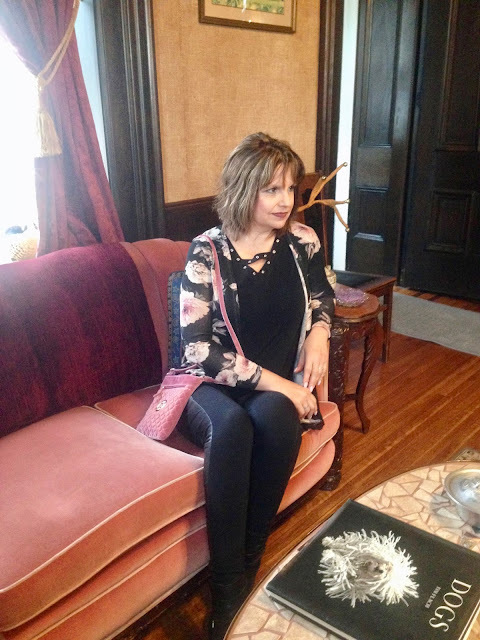 From my experience, I have found that there are certain styles that while they may be trending with the younger population, they can make us older gals look older or frumpy in them. Think midi skirts, florals, maxis, or ruffled tops....I really have to work hard not to look dated if I choose to wear those items. One of the tricks I've learned when styling an old-fashioned piece brought back into popularity, is to pair it with modern, trendy pieces. 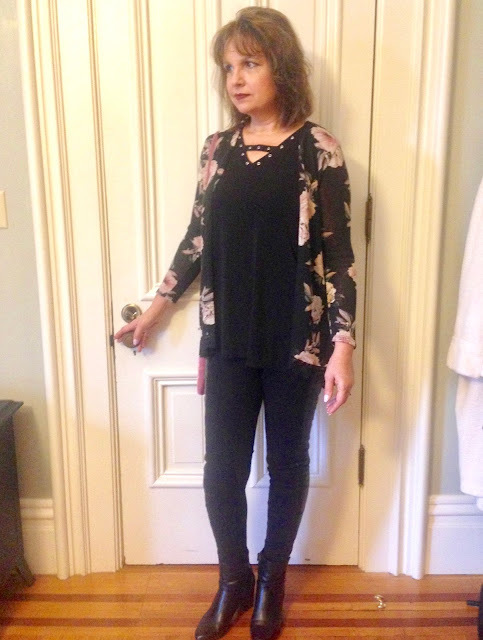 This outfit works because it's paired with faux leather pants, a unique grommet top, and heels. It strikes a nice balance of old-fashioned and modern. I can wear leggings with this sweater and top, because they both cover my behind adequately. While taking these pictures, my husband admitted to me that he did not like this cardigan until I paired it with these pieces. He said it looked too old-fashioned, but when put together with the all- black base and trendier pieces, it looked really nice. I so agree! Sometimes (actually a lot of time) when you bring a new clothing item home, you really have to play around with it until you find something that works. I wore this outfit down to breakfast when we stayed at a bed and breakfast this past weekend. 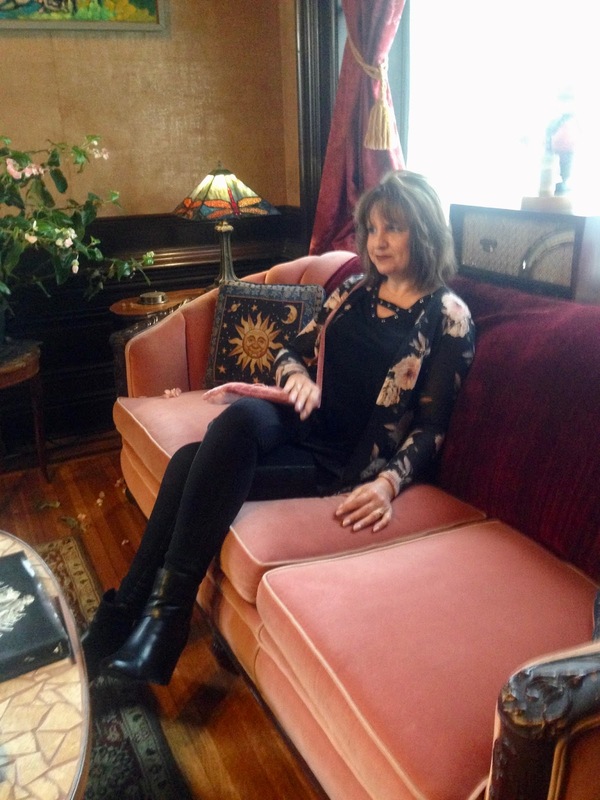 I was thrilled to see the flowers in the cardigan matched the colors of the sofa in the lobby. I picked up this cute little velvet bag on clearance for only $5.99 at Shoe Encore. The floral cardigan is very thin (which I love, who wants more bulk?) and it has a hi-lo cut. It also has pretty black lace on the hem. My faux leather leggings I purchased several years ago at JCPenney. I love that the faux leather is only on the sides of the pants. For shoes, I chose black booties by Liz Claiborne (old). It was so fun having a new location to take fashion photos at the B&B. I just checked the Charlotte Russe website as I write this post, and this cardigan is still available but only in XS and plus sizes (The story of my life. There's never any size mediums). The grommet style top I purchased at CJBanks (no longer available). So what about you? Do you find there are certain styles or pieces that you have to either stay away from or wear with more modern piece so they don't age you? I'd love to hear from you! I think you're exactly right, Amy! !Pairing it with these pants really makes it seem very hip and stylish!! Loving the leggings! And the floral cardigan is so pretty! I really love those leggings! They are really cute and add some edginess to the sweet floral kimono! So pretty and it looks great with the black leggings. The size still available would be perfect for me and such a great price too, but I always feel like large print flowers don't look good on me because I am (almost) petite. Thanks Elli! I tend to prefer a smaller floral print too (thats another reason why I wanted the burgundy cardigan). Oh, and the velvet purse is sooooo gorgeous! And what a great price too! Thank you! I spotted this bag when it first came out and wanted to buy it right away. I'm glad I didn't and waited so I got it on clearance! Hi Amy! I wasn't sure when I read the title but the cardigan looks lovely. Beautiful tones and perfect for the winter season. Alas we are in full Summer here so I'll have to wait a while to wear something similar. Thanks for sharing a #overthemoon. 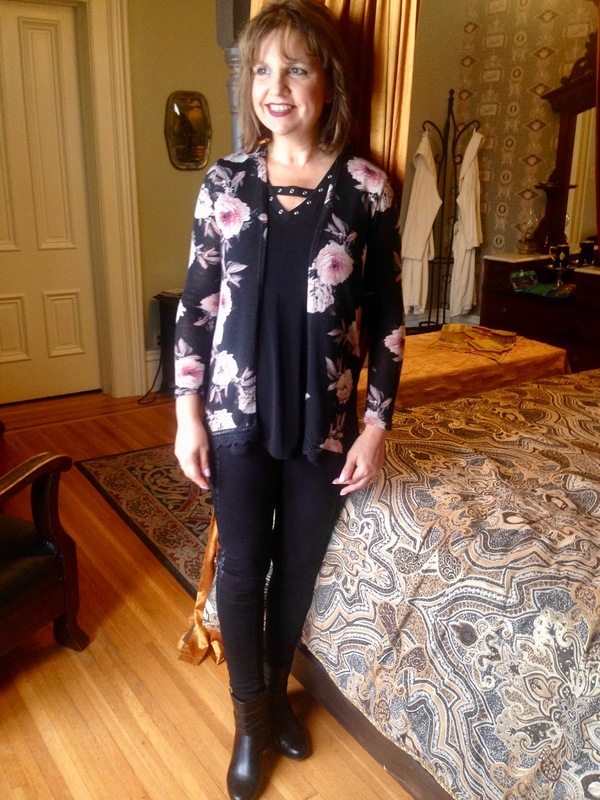 Yes those leggings add sass to the cardigan! I love it. I love the floral cardigan with the edgy black top and faux leather leggings - just the right mix of feminine and edgy! Thanks for linking up with us for Thursday Moda!